The Cape Henlopen High School Vikings put together one of their best team efforts in their last matches of the season May 16, winning both legs of a tri-meet against Milford High and Concord High. Cape’s combined 167 score was the team’s fourth best of 2018, defeating Milford 167-182 and Concord 167-177. Milford senior Kyle Strassle won medalist honors with a very fine 4-under par 32 on the front nine of Rehoboth Beach CC. Nolan Brown led the Vikings with his 38, and felt he should have done better. “I had five birdie putts from 10 feet and I couldn’t make any of them,” he said. Reed Jones turned in his best score of the season, finishing second among the Vikings with a 41. “I had two bad shots and one double bogey on the second hole. I parred 3, 4, 5, and 9, and the rest were bogeys,” he said. Dane Palmer shot a 44, tied with Michael Bollig for the third and fourth scores. Palmer noted the unusual fog that rolled in during the match. He said he had trouble following his ball once it rose into the mist. Bollig recovered from a shaky start to finish even par on his last four holes, including a birdie on the sixth. The Vikings traveled to Maple Dale Country Club May 22 for the 18-hole Henlopen Athletic Conference tournament, for which ten teams qualified. Cape came in third behind Polytech and then Caesar Rodney. Brown led the Vikings with an 84, followed by Palmer’s 87, Ben Skelley’s 90, and Bollig’s 93. The team also qualified for the 36-hole State Championship, scheduled for May 29-30 at Odessa National. I am proud to announce that my new book is out and available for sale. 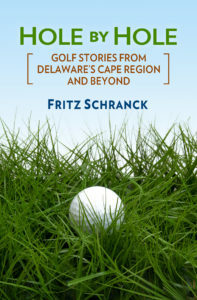 Hole By Hole: Golf Stories from Delaware’s Cape Region and Beyond is an edited collection of some of the best pieces to appear in this column, featuring dozens of locals along with some surprises from the golfing world at large. Just in time for Father’s Day, Hole By Hole retails for only $17.95 and can be found at Browseabout Books in Rehoboth, Biblion Books in Lewes, the pro shops at The Rookery courses and American Classic Golf Club, and from the folks at Out of the Sand in Midway. The first formal book signing is scheduled for Friday, June 15 at Browseabout Books, from 5-7 p.m.
Congratulations to James Callaway for his May 15 hole in one on the 165-yard par 3 third hole at Mulligan’s Pointe. Charles Brown was there to witness the ace, made with a 6-iron. The Camp Arrowhead fundraiser golf tournament has been rescheduled to June 2. The original date was a total washout due to the recent rains. However, playing spots remain open for the event at American Classic Golf Club in Lewes, at $75 per player. The fee covers the golf, drinks, lunch, and prize chances. For more information, call 302-945-0610. Mulligan’s Pointe is holding a weekly putting contest on Fridays, beginning June 1, open to anyone wishing to test his or her skills against the rest of the Cape Region. There are weekly cash prizes, with first place winners each week earning a spot in the final round. The champion earns a spot at the Major Series of Putting contest held in Las Vegas, a national contest I wrote about in a column last year. For more information, contact Mulligan’s Pointe at golf @ mulliganspointe.com. The Rehoboth Beach CC 9 Hole Ladies League played a Fewest Putts game May 22. Bardelle Offutt won with only 17 putts for her round. Laurel St. Germain, Christine Moore, Rosemary Farley, and Kim Hutchinson finished two putts back. The Mulligan’s Pointe ladies played a Mutt & Jeff game May 22, in which the gross scores from the par 3s and par 5s count toward the total. Retta Rose Frampton won first place, with Susan Shockley in second and Carol Love in third. The Mulligan’s Point ladies also defeated Jonathan’s Landing in match play May 22 in both gross and net categories. The Kings Creek CC Ladies 9-hole group played a 2,1,1 team game May 16. This format uses one best net score for the par 4s and 5s, and two best net scores for the par 3s. Kathy Nave, Tina Brown, and Joelie Genevish won the event. Sandy Neverett won the closest to the pin contest on the 13thhole. Fourteen golfers braved the elements for the Kings Creek Ladies 18-hole version of 2, 1, 1 on May 17. Winnie Sewell, Vicki Martina, Carol Loewen, and Faye Slatcher won first place. Second place went to Melanie Pereira, Nancy Froome, Debbie Grant, and Martina on a blind draw. The third spot went to Leslie McClintick, Barb Hines, Anne Farley, and Pereira on a blind draw. Jeannine Doane, Gale DiBona, Joanne Yurick, and Slatcher on a blind draw finished in fourth.